We’re living in a world obsessed with innovation – and with good reason. In the last half-century, supercomputers have shrunk from room-size behemoths to pocket-sized smartphones. A chip-embedded gift card from Starbucks or Nordstrom has more computing power than the machines that guided the Apollo rockets to the moon. Then there are innovations in medicine – from cancer treatment to kidney dialysis to vaccines – that have transformed the length and quality of human life around the world in a matter of decades. Smart people and good ideas are now the raw materials of the global economy, making billions of people more prosperous, more healthy and able to connect and communicate like never before. Many of these innovations had their origins in university laboratories, seeded by public dollars. Then entrepreneurial tech and biotech startups brought to market and took them to scale, growing into some of the largest and most influential businesses in the world. And this innovative activity has been concentrated in just a handful of places, Northern California’s Silicon Valley preeminent above all. When I started researching my first book about the innovation economy many years ago, I was fascinated and surprised to learn that “the search for the next Silicon Valley” has been happening practically since the invention of the transistor. Hundreds of “Silicon Somethings” have bloomed around the world, often falling far short of original expectations. While lots have become key players in the innovation ecosystem, no one has managed to dislodge the original from the top of the high-tech heap. One of the big things that these imitators miss is that Silicon Valley’s innovation ecosystem was the product of a certain time and place – the bucolic suburbs of Cold War America – and that much of its evolution was the result of good timing, serendipity, and a long prior history of technical tinkering and experimentation. But while there’s no magic formula for creating an innovation region, there is a great deal of opportunity for people to act in ways that encourage and nurture this activity. Looking back through human history, we can see that there are certain core characteristics that places of innovation always have shared, from ancient Mesopotamia to present-day Silicon Valley and Seattle. The first is that places of innovation have resources to invest. In Elizabethan London, this capital came in the form of grants the Queen awarded to inventors. In 1950s and 1960s Northern California, it was Cold War military contracts. Another common characteristic is that these are great places that attract and retain talented people from around the world. Today we call it “quality of life” – from good schools to quality housing to lakes and mountains at a city’s doorstep. But a final, absolutely critical characteristic is the presence of institutions that foster creativity and encourage new ideas. From Plato’s School of Athens to the astronomical observatories of the Maya, innovation has bloomed when creative people and scholars are given the time and space to think, collaborate, and experiment. In the modern era, universities have taken on the role of innovative “sandbox,” fostering an explosion of research and discovery at a scale never seen before in human history. They have to be great on the inside. 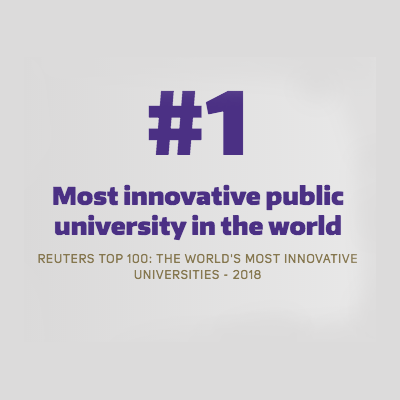 Innovation-driving universities are centers of research excellence, and include units that are among the very best in the world at what they do. Universities spur innovation when they have faculty and students who are pushing the envelope in certain areas of exploration, and who are given the resources to realize the highest teaching and research goals. It’s not a coincidence that the regions with the world’s strongest research universities—from California to Boston, Cambridge to Tokyo—are home to some of the biggest clusters of innovative industry. Starting in the 1950s, Stanford leaders moved their university from middle-of-the-pack to world-class by identifying emerging technologies—from silicon semiconductors to gene sequencing to online search—and recruiting top faculty and students who could build centers of research excellence around those technologies. The University of Washington in tech boomtown Seattle is a biomedical juggernaut, winning more federal research grants than any other public university in the U.S. Connect the dots: the presence of research strength creates a virtuous circle that attracts more talented people and more resources to support invention, innovation, and creative production of all kinds. They must be engaged on the outside. Innovation-driving universities are engaged, enthusiastic partners with people and organizations beyond the campus. They are empowered to lead and participate in audacious projects to grow next-generation economies, increase economic equity and opportunity, make neighborhoods healthier and livelier, and support local and regional governments in addressing social and economic challenges. We see this partnership leaving a positive footprint in West Philadelphia, where Penn and Drexel have made major investments in local infrastructure, community programs, and public schools. The result is a neighborhood with thriving public elementary schools, dynamic job opportunities, and new housing opening by the month. We see this in Barcelona, where ten universities are part of a regional partnership to build innovation clusters leveraging the city’s strengths in media and food biotech. The result is the transformation of a century-old industrial neighborhood once known as the “Catalan Manchester” into a vibrant innovation district. They attract extraordinary people. We often measure universities’ innovation impact by the numbers of patents or spinoff companies they product. These metrics matter, a lot. But at the end of the day, it’s people who are creating those patents and founding those companies. Such entrepreneurial people are drawn to universities that encourage audacious thinking, reward innovation, and break down the barriers between the lab or classroom and the rest of the world. It’s not just faculty, either. Students are drawn to a university because of its teachers and its reputation for innovative thinking, and also for its campus culture. They then stick around to start companies, with help of their faculty mentors and peers. From Bill and Dave to Sergey and Larry, it’s the people – not necessarily the technology – that can be universities’ greatest gifts to an innovation economy. That’s why you find innovation centers in college towns known for their funk and their fun like Boulder and Austin, and in hip cities with a critical mass of higher ed institutions, from Berlin and Bangalore to Munich and Melbourne. Let me be clear about one thing. Universities don’t have to be “elite” or exclusive in order to be major contributors to the innovative process. Leland Stanford founded his university in 1891 as a tuition-free institution to give students access regardless of family wealth (one “poor boy” who attended was Herbert Hoover, who went on to become a self-made millionaire before the age of 40). Even in the 1950s, it was a relatively scrappy, on-the-make place that didn’t yet have Ivy League prestige. The students who went on to become high-tech titans didn’t come from prep schools and fancy backgrounds; they came from middle-class families in Texas, Iowa, and California. Being open and accessible to a wide range of people — even those who might not look like a “typical” student or scholar – is critical to a university being able to think differently, to act dynamically, and to invent the future. So does having a commitment to world-class research and teaching. Rather than being contradictory, the two goals – excellence and accessibility – can and should reinforce one another. While we need to recognize that while there won’t be “another Silicon Valley,” great innovative regions will emerge – and these will be places with abundant resources, great quality of place, and world-changing institutions. And they have a great opportunity to improve on the current innovation model. We can empower a region’s people and institutions to be innovators in multiple realms – not just tech innovators, but social innovators as well. Some might argue that inequality is an unavoidable byproduct of innovation. The track record of past generations shows this just isn’t so—America sent a man to the moon during an era when its middle class had more upward mobility and economic security than any other time in history. We should think about innovation and inclusion as twinned, mutually reinforcing goals. And in revving this model, let’s turn to higher education institutions and take advantage of their unique function in the innovative ecosystem. It’s there that we’ll find the sources of new ideas, spaces for audacious experimentation, and the next generation of innovators. This article is one in a series written for CoMotion, the UW’s innovation hub. To learn more from UW innovators, visit uw.edu/innovation. This article also appeared March 14, 2016, on Route Fifty.